Just as Sam starts to draw an epic velociraptor, Eva wants to collaborate with him. If that's not bad enough, Eva can't tell the difference between a pony and velociraptor. Eva joins anyway with her interpretation and soon the two are locked in a creative clash that includes lightning and explosive confetti. Soon Eva tires of their artistic masterpiece, leaving Sam to draw solo. 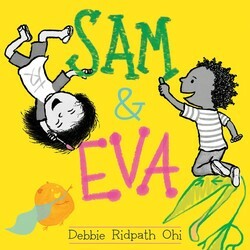 Though Sam gets rid of Eva like he wished for from the beginning, he discovers it's not the same. Will they ever get the chance put their talents to work together again? This book can be purchased on Amazon.